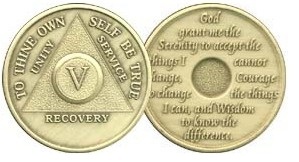 This is the classic AA medallion given for time in sobriety by many groups. Also called an AA chip, they are available in 24 hour, months 1 through 11 & 18 and years 1 - 65. They are also available with a blank center.